It’s the simple, common-sense observation that there’s not a linear relationship between tax rates and tax revenue. Folks in the private sector understand this principle. No restaurant owner, for instance, would double meal prices and assume that revenues would climb by 100 percent. Yet that’s basically the methodology used by the Joint Committee on Taxation when estimating the revenue impact of changes in tax rates. Which helps to explain why Washington is so often wrong about revenue implications of personal tax rates and corporate tax rates. 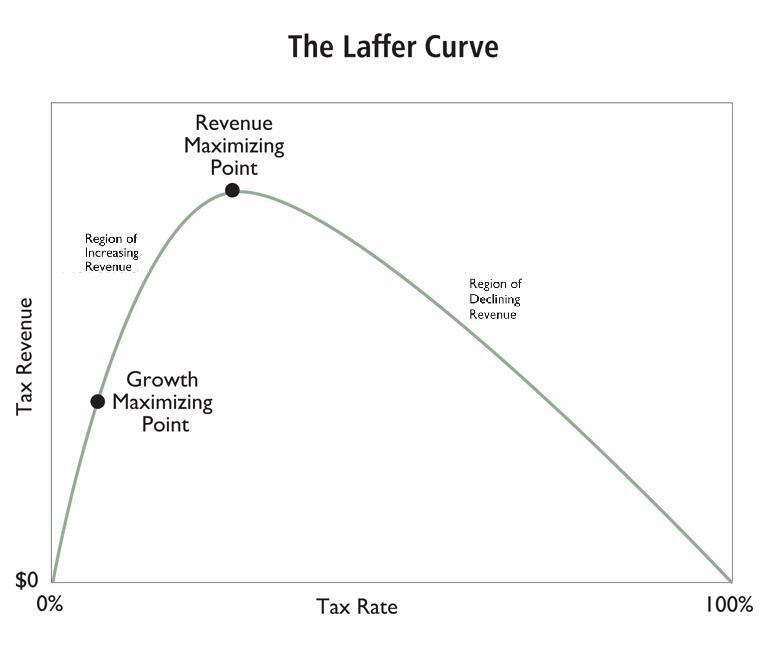 The Laffer Curve also applies to tobacco taxation. Patrick Gleason of Americans for Tax Reform points out in the Wall Street Journal that greedy politicians in New York have pushed cigarette taxes so high that the main beneficiaries are smugglers. Rampant cigarette smuggling isn’t the problem in New York. 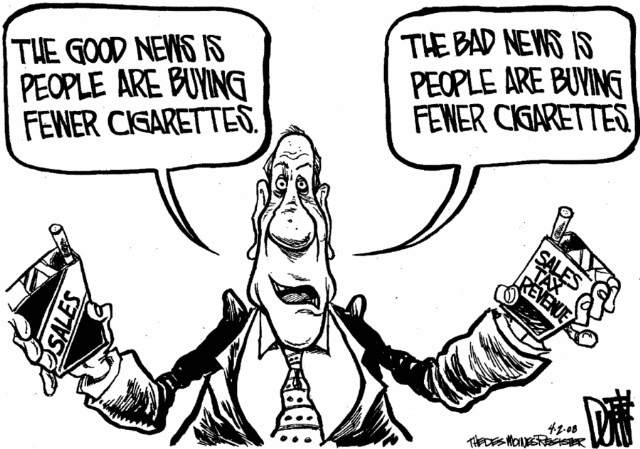 It’s a symptom of the problem: sky high tobacco taxes. …New York state levies the highest cigarette tax in the nation, $4.35 per pack, and New York City tacks on an additional $1.50 local tax. All told, the cost of one pack there can run to $12 or more. …The result? Most of the cigarettes smoked in New York, 58%, are smuggled in from out of state… The higher that revenue-hungry politicians raise tobacco taxes, the more profit smugglers can make. Which means, of course, that the higher tax rates don’t lead to more tax revenue. …revenue from increases in cigarette taxes often falls short of expectations. Washington, D.C., experienced this firsthand after cigarette taxes were raised by 25%, to $2.50 per pack from $2, in October 2009. City leaders claimed the hike would generate a windfall of additional revenue. By February of 2010, D.C.’s chief financial officer reported that projections were off by $15 million. Revenue from the cigarette tax actually fell by $7 million after the hike. New Jersey should have learned the same lesson. In 2007 the Garden State raised cigarette taxes to $2.575, from $2.40. The new tax generated $52 million less than expected, and revenue from cigarette taxes fell by $22 million. But in 2009 New Jersey raised the tax by another 17.5 cents. By the way, don’t believe the fall-back excuse that politicians don’t care about revenue because they’re motivated by public health concerns. Lawmakers can claim they’re raising taxes on cigarettes to reduce smoking and improve public health. That talking point is belied by the recent imposition of taxes on electronic cigarettes, which are saving lives by delivering nicotine in puffs of water vapor instead of chemical-filled smoke. There are more than 15 tax bills pending across the country for currently untaxed e-cigarettes. Hawaii is proposing a tax of 80%, New York of 75%, Oregon of 65% and Ohio of 60%. For politicians, cigarette taxes are—and have always been—about one thing: money. One last thing. Gleason reports that New York is suing UPS because the company ships cigarettes to New York customers. New York state and New York City in February announced a $180 million lawsuit against the shipping company UPS over what officials allege was unlawful delivery of nearly 700,000 cartons of cigarettes from 2010-14. …New York state officials claim that the cigarette smuggling via UPS cost the treasury $29.7 million in lost tax revenue. That’s less than 0.03% of the state budget. The $4.7 million allegedly lost by New York City represents less than 0.006% of its budget. For a mere rounding error, state and city officials want to grab $180 million from UPS. That’s $180 million UPS could use to hire new workers, give employees raises, or invest back into its business. The leaders of New York and New York City should drop this silly lawsuit and find a more productive use of their time. They shouldn’t merely drop the lawsuit. They should be condemned for engaging in a thuggish shakedown. Returning to the main topic, here’s a video from the Center for Freedom and Prosperity that reviews real-world examples of the Laffer Curve. P.S. If local officials are greedy, state officials are ever greedier, and federal officials are greediest, then you can imagine how awful it would be to let international officials impose tobacco taxes. Taxes should not be cut to maximize tax collection but should be deep enough to reduce the government’s take. As the economic credentials of the political parties in the UK 2015 election get scrutinised, it is worth bearing in mind the ‘Laffer Curve’ effects on fiscal policy. Don’t increase our overall taxation burden and tax rates, please…from Dan Mitchell at the Centre for Freedom and Prosperity at the Cato Institute, lessons from the other side of the pond.